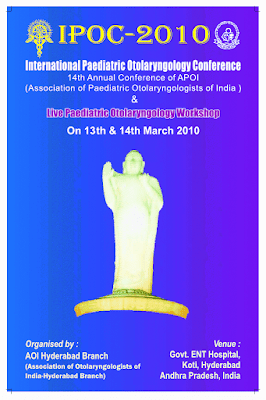 Now that the first announcement for te IPOC -2010 (International pediatric Otolaryngology-2010 is ready). I am attaching the brochure for your kind perusal, thoughts, advise and communication across to our ENT , Pediatricians, Pediatric surgeons, Pediatric Anaesthesiologists, Pediatric Pulmonologists, Pediatric audiologists, Swallowing disorders specialists, and Pediatric Otolaryngology nursing personnel. We are making all efforts to make it a good academic feast. Looking forward for welcoming the esteemed International, national faculty and delegates from India and abroad in the second week of March 2010 at Hyderabad, India.